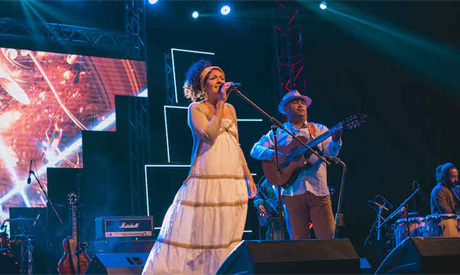 Egyptian singer and songwriter Shahira Kamal is gearing up with her band Shahira Welnas ElKhatira for a weekend event at Room Art Space. Accompanied by Basem Abu Arab on bass guitar, Lowai Gamal on percussion, Hazem Sadek on keyboards and Micheal Yehia on guitar, Shahira will perform songs about romance, philosophy and social sarcasm. Established in October 2016, the band performed frequently in Cairo and Alexandria and was featured on TV channels and radio stations, as well as in festivals such the as Genaina Theatre Hay Festival June 2017, D-CAF 2018, 3alganoob Festival, and Cairokee Empire. The event will also feature Nesma Herky, a female vocalist and songwriter who collaborated with many known musicians like Hisham Kharma, Hanan Madi, Zigzag, Hany Adel, Mai Abdel Aziz, Hany Al Dakkak, Cairokee and Abd El Rahman Roshdy.